The National selection committee, on Friday, announced India's squad for the upcoming T20I and 5-match ODI series against Australia. Regular skipper Virat Kohli and Jasprit Bumrah, who was rested for the entire limited-over International leg across the Trans-Tasman, make their way back into the team while Dinesh Karthik, Khaleel Ahmed, Shubhman Gill, Siddarth Kaul, Mohammad Siraj, and Ravindra Jadeja have been left out from the 15-man squad for the ODI series. In the T20I team, teenage leg-spinner Mayank Markande has earned his maiden call-up to the national set-up while Kuldeep Yadav and Bhuvneshwar Kumar have been rested. Kumar has also been rested for the first two ODIs and will make a direct swap with Siddarth Kaul for the remaining three matches. Umesh Yadav has also made a return to the T20I side but has not been considered for the subsequent ODI series. Out of favor opener, KL Rahul has been recalled for both the T20I and ODI series while Test wicket-keeper Rishabh Pant and all-rounder Vijay Shankar have been named for all 5-games. What better than to celebrate a five-wicket haul with a maiden call-up to the national side? It's been that sort of a day for Mayank Markande. The teenage leg-spinner, who claimed 5-31 against the touring English Lions earlier in the day to help India A coast to an innings & 68 runs victory was rewarded with a call-up to the Indian T20I side for the 2-match series coming up against Australia. It has been a long time coming for Markande. 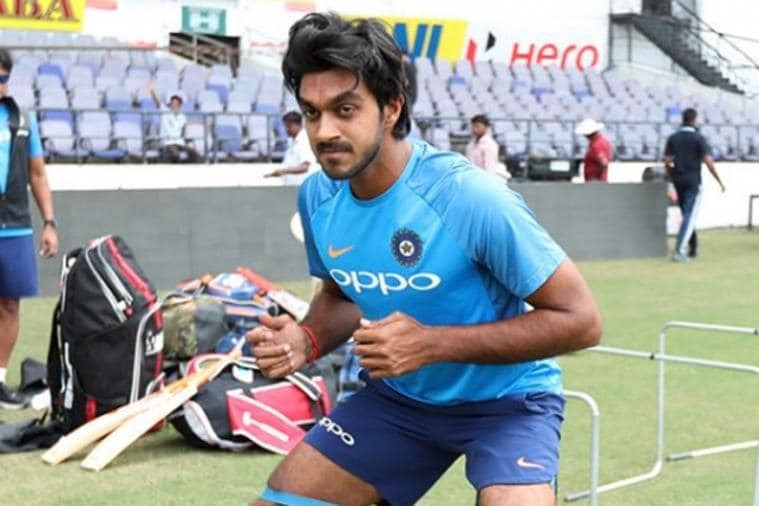 The leg-spinner, who outfoxed the likes of Kohli and Dhoni with his wrong'un in last years' IPL, has been churning out consistent performances both for India A and his state team in the past 12 months across the three formats of the game- First- Class, List-A and T20s. Chief Selector MSK Prasad reckoned that Markande is being looked at as a potential third spinner and the T20I series gives the leg-spinner a chance to stake his claim for a potential place in next years T20 World Cup in Australia. Has Pant edged Karthik for the 2nd wicket-keeper slot? Before the announcement of the squad, MSK Prasad had reckoned that 12-13 places for the World Cup squad have been zeroed in, with two spots still up for grabs. With MS Dhoni locked in as the first-choice keeper, it was going to be a shootout for the second wicket-keeper's slot between Rishabh Pant and Dinesh Karthik. "We have included him [Pant] considering the fact that he is a left-hander and we are going to discuss with the team management. We will try and figure the best possible batting position for Pant. With a left-hander in the side, there is an advantage of left-right combination," MSK Prasad, India's chairman of selectors, said. "We want to give Pant a few ODIs before taking a final call on World Cup." With Pant getting a place in the side for all the 5 ODIs and DK left out, it looks like the former may have edged out the KKR skipper for the World Cup spot. KL Rahul as the back-up opener to Rohit and Shikhar; Rahane misses out? It has been indifferent past few months for KL Rahul following his lack of form and off-field shenanigans that led to his suspension during India's limited-overs leg of the Trans-Tasman. Such was Rahul's form that the selectors had to look for other options for the back-up openers slot, bringing in the likes of Ajinkya Rahane in contention. Prior to today's selection, Rahane and Rahul were vying for the 3rd openers' spot but the latter back-to-back half-centuries [81 & 89] against the Lions' in the ongoing 4-day series may have sealed the deal for him. No left-arm fast bowler; Shankar as the back-up all-rounder; end of the road for Jadeja? Khaleel Ahmed was looked upon as a left-arm bowling option ever since he was selected in last year's Asia Cup but Ahmed has failed to make use of his opportunities and with Mohammad Shami delivering consistently in the last two ODI series against Australia and New Zealand, it seems like India have zeroed-in on a 3-man pace attack- Bhuvi, Bumrah, and Shami for the 2019 World Cup. "Shankar's performance in the recent series really changed a bit of dynamics and he brings a double impact to the side that's why have we have included him. We'll see how he performs in the next few matches," he added. Like Khaleel, Ravindra Jadeja has been a part of India's squad since the Asia Cup but has not featured in any of the games against Australia and New Zealand, and with Vijay Shankar putting up an impressive show in New Zealand, and Jadhav contributing as the third spinner, it looks like the end of the road for Jadeja as far as the 2019 World Cup is concerned. "Book your Bharat Army ultimate experience with our inclusive hospitality packages and stand a chance to be close to Team India. Visit our website to grab your seat now!"